Speed is a Table minigame in New Super Mario Bros.. As it requires two people to play, it is only available in wireless Versus mode. The rules are exactly the same as the real-life card game of the same name. Players are dealt half the deck (26 cards) each. These cards are then divided into a "hand" of five cards and two replacement piles of 6 cards. The top card of each pile is drawn off and placed face down in the middle of the play area to form the "speed cards". The remaining 15 cards are placed aside to replenish the player's hand. Play begins by flipping over the speed cards and then each player's hand. Each player uses their stylus to play a card either one number above or below one of the speed cards. For example, a 4 or 6 can be played on a 5, and a King or a deuce can be played on an ace. When a card is played, another card is automatically drawn from the player's 15-card pile and placed into the player's hand. If none of the player's cards can be legally played, then they will be notified by the game and their play stops for the moment. When the other player cannot play any cards, two new cards are drawn from the replacement piles. The winner is the first player to legally play all of their 15-card pile. For three and four players, two decks are used. For two players, P1 uses black cards and P2 uses red cards. 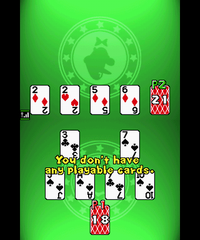 For three or four players, P1 uses two sets of clubs, P2 uses two sets of spades, P3 uses two sets of hearts, and P4 uses two sets of diamonds. Diamonds are not used with three players. This page was last edited on December 3, 2018, at 02:27.